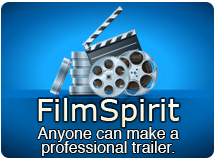 Transfer music, movies, online videos, photos, books and apps from Mac to iPod in fast speed. iPod transfer to mac, backup iPod contents to Mac or iTunes in minimum clicks. iPod converter, Convert home CD music/DVD movies/online videos to iPod compatible audio/video files. Embedded with the most popular online video websites. Create iPhone ringtones from any audio and video file conveniently. Fast output to any iPod/iPod touch/iPhone model. Support connecting multiple devices at the same time to share files with each other. The made-to-measure iPod managing tool, 4Media iPod Max Platinum for Mac is designed for Mac users to transfer all multimedia files between iPod, Mac and iTunes, transfer apps between Mac and iPod, convert Home DVD movies and CD music to iPod compatible video and audio files for playback on iPod, put popular video and audio files on iPod, as a ipod converter, download and convert online videos to iPod, make iPhone ringtones from any audio/video file and back up your iPhone SMS messages etc. This easy iPod Max Platinum provides maximized support with nearly all iPod types including iPod classic, nano and touch, and iPhone, to solve your problems with playing any video, audio, Home DVD movie on iPod and iPhone. 4Media iPod Max Platinum for Mac supports connecting multiple devices simultaneously and you can easily transfer files between different iPods and iPhone. Don’t worry if you misplace your data connection cable 4Media iPod Max Platinum for Mac supports Wi-Fi. With the efficient enhancement for file transferring and multimedia file conversion, 4Media iPod Max Platinum for Mac will assure you the fastest transferring speed and the best picture quality in conversion experience--the best iPod transfer to Mac. Manage all contents in iPod/iPhone, including music, movies, pictures, books, photos shot by the devices, app documents, transfer iPod/iPhone to Mac or iTunes conveniently and securely. iPod transfer to Mac--Directly transfer target multimedia files into iPod/iPhone in fast speed without iTunes. iPod converter--Convert popular videos/audios to iPod video files or audio files, for example, convert , M2TS, MTS, AVI, MPEG, WMV, DAT, TS, MPV, NSV, MOV, QT, H261, H264, WMA, AAC, AIF, AIFF, AC3 and etc to iPod/iPhone music/movies. Don't worry about losing your contacts and SMS, you can back up your contacts and SMS from your iOS device to your Mac and import it back to your device in case you accidently lose them. Enables you to Convert CD and DVD to suitable formats to allow you to enjoy favorite CD music/DVD movies on iPod/iPhone freely. You'll enjoy the album art in your music collection even more in 4Media iPad Max Platinum for Mac. Use Cover Flow to flip through your digital music. Grid View lets you browse all your music, movie, picture by their cover art. Or Search your collection by Album List View, Artist list view, Genres list view or Composers list view. No matter which way you browse, you'll quickly find exactly what you want to hear and watch. View your music playlist in Thumbnail view. You can even choose the image from your computer to put it as a thumbnail image. Apply the image to whole genera or album or playlist. Show your song in the related playlist. 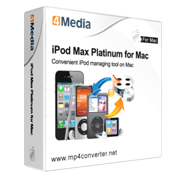 4Media iPod Max Platinum for Mac enables you to logon top online video websites directly, download and convert exciting online videos to iPod/iPhone in one-step. This program also empowers you to make customized iPhone ringtones from various audios/videos and transfer to iPhone instantly. Fully support all iPod/iPhone/iPad models: iPad, iPad 2, iPad 3, iPad 4, iPad mini, iPad mini 2, iPad mini 3, iPad mini 4, iPad Air, iPad Air 2, iPad Pro (12.9/9.7/10.5 inch), iPod, nano (5th Gen), iPod mini, iPod shuffle, iPod classic, iPod touch, iPod touch 4, iPod touch 5, iPod touch 6, iPhone, iPhone 3G/3GS, iPhone 4, iPhone 5/5S/5C/SE, iPhone 6/6 Plus, iPhone 6S/6S Plus, iPhone 7/7 Plus, iPhone 8/8 Plus, iPhone X, iPhone XS, iPhone XS Max, iPhone XR. Support iOS 12 and iTunes 12 as well. Embedded with the most popular online broadcasting websites within the application, including YouTube, Metacafe, Dailymotion, Break, Vimeo, Revver, Blip, Vidilife and Stickam to download and convert online videos in one click. Create, edit or delete iPod/iPhone playlists and photo albums with ease; classify files by genre, artiest and album transfer PDF/EPUB books into devices. Preview iPod/iPhone videos/music and DVD movies directly and capture screenshots in one click. Automatically select the optimized profiles when importing files to simplify the process. Fully compatible with iPhone 5, iPod touch 5, iPod nano 7, iOS 6.1, iTunes 11.0.